Comet C/1995 O1 Hale–Bopp, which shone in the night sky in 1997. 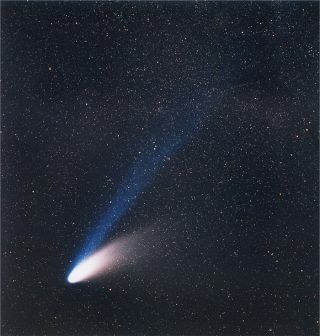 Long period comets such as Hale-Bopp were once deemed to be the primary impact hazard to Earth. This gallery showcases the first images taken by NASA's Wide-field Infrared Survey Explorer (WISE) spacecraft. Comet Siding Spring flashes across the sky impressively in this infrared image. Observers in Australia discovered the comet, also known as C/2007 Q3, in 2007. A long-period comet called 2001 RX14 (Linear) turned up in images captured in 2002 by the Sloan Digital Sky Survey telescope in New Mexico.